Integra’s products are offered in a variety of packaging options allowing fabricators to choose the system that works best with the job at hand. Whether you just need a small amount of colored adhesive for a deck seam, or a large amount of adhesive to high-volume granite reinforcing we have the containers to suit your needs. Ideal for smaller applications, or field install seams. The 100ml Cartridge was specially designed to accommodate a standard caulking gun dispenser with the use of a bundled adapter. Integra manufactures our own Caulking Gun/100ml Dispenser that features non-drip functionality and a mechanical advantage suited for dispensing our adhesives. Two products are currently offered in the 100ml cartridge size: Surface Bonder XI and Composite Bonder RTP01. The 250ml is our flagship cartridge. 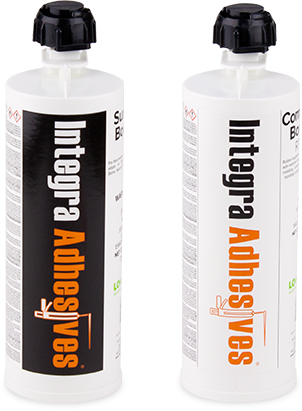 Available in two products: Surface Bonder XI and Composite Bonder RTP01. The 250ml size is perfect on the job-site or in the shop, and is available with our entire range of color options. The universal design fits in most 10:1, 250ml dispensers, but we recommend the Integra 250ml Dispenser for best compatibility. 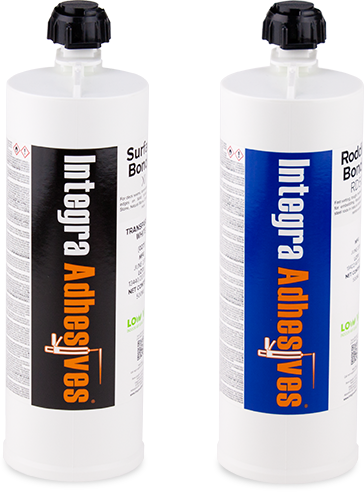 Depending on use the 250ml Surface Bonder XI can yield 40 lineal feet for seaming while the Composite Bonder RTP01 provides coverage up to 1 square foot, enough for 40 SINK CLIPS! The 500ml cartridge is perfect for high volume output. Available in a limited range of Surface Bonder XI colors meant for shops that work with consistent material. The 500ml cartridge is also the choice size for our Rodding Bonder RD50. Reinforcing granite tends to require larger volumes of adhesive, so the cost effective 500ml container is a perfect solution for maximum savings of time, money and labor. Our 500ml fits in many standard 400ml/470ml dispensers, but works best with Integra’s 500ml Dispenser and the Newborn Pneumatic Dispenser. 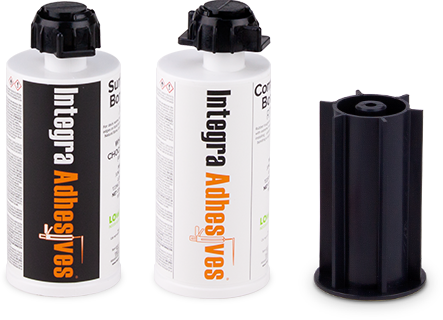 The 200ml cartridge is a 1:1 ratio cartridge offered exclusively for our unique polyurethane adhesive, Substrate Bonder SB100. 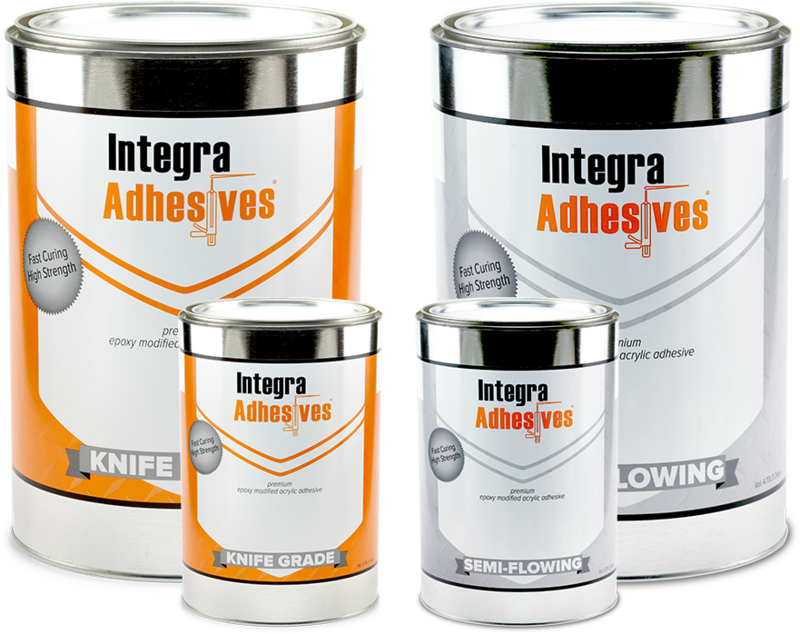 The cartridge provides consistent output of large amounts of adhesive for a host of applications. For best results pair with Integra’s 200ml 1:1 Dispenser. Our Surface Bonder XI is also available in bulk packaging. We’ve created a Semi-Flowing and a Knife Grade formulation and packaged it in two container options: 1.25 Gallon Cans and Quart Cans. These are offered in limited base colors with sets of pre-configured tints specifically formulated for Natural Stone. Other bulk packaging, such as 5 Gallon Pails and 45 Gallon Drums are available upon request. Contact Us to learn more.